PC Wells has had Obi (or LinPol Luke, to use his full name), since he was an eight-week-old puppy and started training. The pair has worked together every day since. 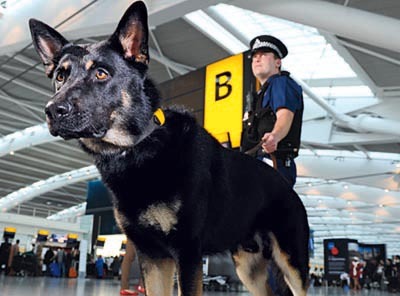 Obi was bred at the Metropolitan Police Dog Training Establishment, in Keston, Kent-the Met has its own breeding programme, to ensure that it gets the best possible calibre of dog. These are, for the most part, spaniels and German shepherds, who work until they’re about eight years old. At 12 months, all Met police puppies are tested for suitability. Once Obi passed this phase, he and PC Wells went on a three-month course together. Far from being daunted, PC Wells says that Obi seemed focused, and keen to continue with his work. ‘He showed remarkable courage, above and beyond the call of duty.’ Following CT scans the next day, it emerged that Obi’s skull was fractured, but after much ‘love and recuperation’, he was soon back to his ‘bouncing best’. He recently received an award for his bravery during the riots. Obi and PC Wells continue to work as part of 1 Unit Dog Support in north-west London.